« New York Times – Please Fix Yourself! This all started last week with the Aussie-birthed campaign Ten Grand is Buried Here, whose intent was to persuade users to download IE8 and follow a bunch of clues to find 10K online. Let me start by saying that I applaud the thought: were IE6 (which is now over 8 years old!) to vanish from the earth, I would be a very happy web developer. So, good idea. Kudos! The catch (or let’s say, ‘the hook’) was, of course, you could only find the money using IE8. This was reiterated several times on the page, along with browser-specific digs on whatever non-Microsoft product you used to visit the page. Firefox is ‘old,’ (as old as IE? ), Safari is ‘boring’ (again, as boring as IE? ), Chrome is ‘tarnished’ (ha!). The upper brass at MSFT decided to change their tune this week — opting to remove the browser-specific digs and make the page viewable to all. Maybe it’s not a good idea to alienate potential users of their product, they decided. Clever. This morning I found the more formal IE8 campaign — a subtle information / spin campaign on the product page that further attempts to convince users that IE8 is the best. 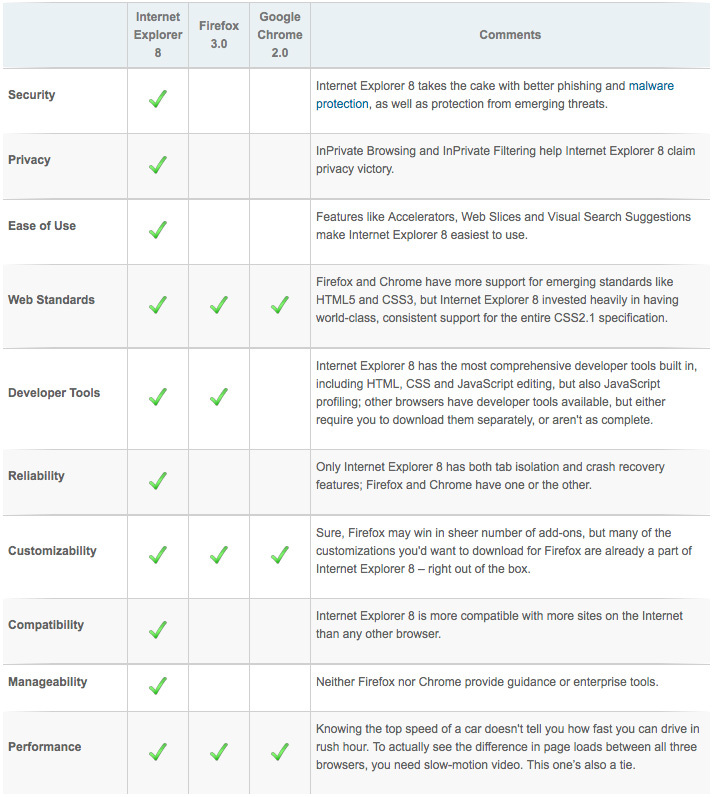 My favorite part is the Browser Comparison tab which, without stating any facts, declares IE8 to be superior in 8 categories: Security, Privacy, Ease of Use, Web Standards, Developer Tools, Reliability, Customizability and Compatibility. First off, where’s Safari? Where’s Opera? Third, some of the claims they make are ridiculous. IE8 is more standards compliant than Firefox? And Chrome? Both of which score way better on the Acid 2 and Acid 3 tests? Are you high? And IE8 is only more compatible with more sites on the internet because those sites were coded for IE6, and won’t render anywhere else. Plus, IE hasn’t run on Mac since version 5.5. That’s not particularly compatible with anything. And then there’s the MythBusting tab. Which ventures into the realm of pure delusion. Myth #1: Internet Explorer is much slower than Firefox and Chrome. They claim their browser is faster because, once you learn all of their application shortcuts (Accelerator, Smart Address Bar), you can get around faster than you can if you use a browser that doesn’t have these features. If we pick apart this statement, they’re basically saying their browser application is slower, but that you can work around it. Of course they also neglect to say that Chrome and FF already have most or all of these features. Which renders the whole thing a choice between a slower browser that has nice user shortcuts or a faster browser that has the same user shortcuts. Myth #2: Internet Explorer is less secure than Firefox. Sites a Microsoft-sponsored NSS Labs report that Opera has already called into question. Myth #3: Firefox is a richer, more adaptable browser than Internet Explorer. Firefox and Chrome are based on open-source technologies. They are therefore virtually infinitely adaptable, and therefore ‘richer.’ And while there may be a ton of IE8 add-ons, I can definitely say not all of them are free. I’ve never had to pay for a Firefox add-on. Myth #4: Internet Explorer doesn’t play well with Web standards. Let me start by rephrasing this as 3 more specific statements. 1) IE has a history of not playing well with web standards and 2) IE8 does better than previous IE versions where web standards are concerned, and 3) IE8 is more web-standards compliant than Chrome and Firefox 3. 1: true. There is no denying IE has never played nice with web standards. They are the reason you can’t make an AJAX call without a browser test. 2: true. Sure. It can’t have gotten worse. Right? In addition to passing more of the official CSS 2.1 test suites than any other browser, Microsoft got really hands-on in the overall testing process by developing and contributing thousands of new tests for the consortium. This is an uncited reference to this internal blog post, which states IE8 passes more of its own CSS 2.1 tests than any other browser manufacturer. Tests which have been submitted to the w3C, but which have not yet been accepted by the consortium. Plus CSS 2.1 is the last generation standard. Who cares if they made up more tests for themselves to pass if the tests are for a spec that is slowly becoming obsolete? 3.0 is the current/next gen standard. It’s just sad. These guys used to be innovators. And they have a massive number of people working for them up in Redlands. Why can’t they just develop a great product, instead of developing one that they know is inferior and then pretending it’s better? One can only pray their market share continues to slip. Maybe then they’ll get the message. UPDATE: I just found Michael Calore’s analysis of IE8’s MythBusting on Webmonkey which says a lot of similar stuff. And is pretty hilarious. This entry was posted on Monday, June 22nd, 2009 at 1:46 pm	and is filed under 'Puters, Rants and Raves. You can follow any responses to this entry through the RSS 2.0 feed. You can leave a response, or trackback from your own site.